The goal of the IndLinux project was to create a Linux distribution that supports Indian languages at all levels. This "Indianisation" project will strive to bring the benefits of Information Technology down to the Indian masses. We want to make technology accessible to the majority of India that does not speak English. The task of localisation has several pieces that need domain expertise. Some examples are I/O modules, development of fonts, kernel enhancements, word translation etc. The project was looking for experts and volunteers to champion the cause of Indian language computing. You may volunteer and participate here. The Indian Linux project was open source and completely free. It was licensed under the GNU General Public License. Rate this project This is a new development release of Mandrakelinux 10.1 for PowerPCs: "Three 700MB images this time, so a few more packages included. New in RC1: mostly in sync with 10.1/x86; airport support enabled; ghostscript and libpng problems should be fixed; several other packages like apache and php modules updated; OpenOffice.org 1.1.3 final. The default yaboot entry problem is not really fixed, but may have disappeared. Please report results. Included kernels still do not work on beige G3s. Send problem reports and other comments to the mailing list." The announcement, release notes, hardware support status. Download: Mandrakelinux-10.1rc1-CD1.ppc.iso (696MB), Mandrakelinux-10.1rc1-CD2.ppc.iso (701MB), Mandrakelinux-10.1rc1-CD3.ppc.iso (699MB). 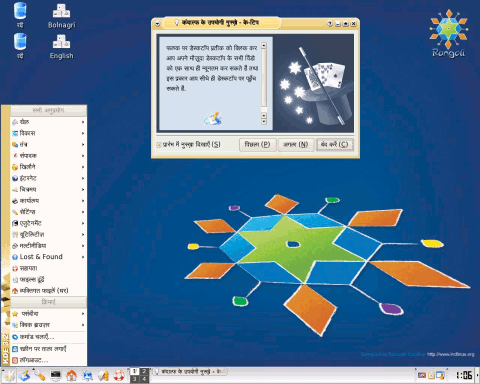 Mandriva Linux was launched in 1998 under the name of Mandrake Linux, with the goal of making Linux easier to use for everyone. At that time, Linux was already well-known as a powerful and stable operating system that demanded strong technical knowledge and extensive use of the command line; MandrakeSoft saw this as an opportunity to integrate the best graphical desktop environments and contribute its own graphical configuration utilities to quickly become famous for setting the standard in Linux ease of use. In February 2005, MandrakeSoft merged with Brazil's Conectiva to form Mandriva S.A., with headquarters in Paris, France. In August 2010 the company suspended the trading of its shares on the Euronext stock exchange. Mandriva SA was formally liquidated in May 2015. Per Øyvind Karlsen has announced the availability of the second alpha release of the new "Moondrake GNU/Linux" which is a possible new name for the venerable Mandriva Linux distribution: "Yet again keeping up the tradition of delays, a new prerelease is out: Moondrake GNU/Linux 2012 Alpha 2. Some highlights of this release are: ISO image creation tool has been rewritten in Python, made several times faster and merged with DrakX; dual-architecture ISO image features a complete set of all LXDE packages; new, complete sound theme; initial work on rewriting installer and libraries in C++ has been started; installer stage 1 and rescue mode merged; much extended set of packages built for uClibc environment; GRUB 2 has replaced isolinux for the installer; KDE 4.9.2." See the full release announcement for further notes. Download: moondrake-2012-alpha2-dual-cd.iso (704MB, MD5), moondrake-2012-alpha2-x86_64-dvd.iso (3,838MB, MD5). Per Øyvind Karlsen has announced the availability of the first alpha release of Mandriva Linux 2012: "As many of you might already be aware of, our first Mandriva Linux 2012 alpha has been ready for release for almost a week now, yet it only made its way to the public mirrors today, so with that I declare it as officially released! Some of the highlights since 2012 Tech Preview include: faster, smaller and much improved installer; installer text-mode is now working again; a slimmer, much-improved and fixed rescue mode; dual architecture CD image has been improved with a more complete set of packages filling it and also LXDE now shipped with it and installed by default; switch to Linaro's GCC 4.7 branch has been completed; HAL has finally been put to rest for good...." For more details please read the release announcement and release notes. Download the installation DVD images from here: mandriva-2012-i586-DVD.iso (4,165MB, MD5), mandriva-2012-x86_64-DVD.iso (4,201MB, MD5). Per Øyvind Karlsen has announced that a technical preview of the upcoming Mandriva Linux 2012 is now ready for download and testing: "As several might have noticed, I already (unofficially) released ISO images for this release a few days ago, but we hesitated a bit about making it official quite yet. As no big blunders have been reported and the feedback has been pretty nice in general, I've now pushed the release to the public mirrors and now consider it as official. This also means that people may now start pushing more experimental stuff to the Cooker again." Here is the brief announcement. The release is built on top of Linux kernel 3.4.1 and includes KDE 4.8.4, GNOME Shell 3.4.1, Xfce 4.10, LXDE 0.5, LibreOffice 3.5.2, Firefox 12.0 and the usual range of open-source software applications. Download the installation DVD images from here: mandriva-linux-bernie-lomax-2012-i586-DVD.iso (4,156MB, MD5), mandriva-linux-bernie-lomax-2012-x86_64-DVD.iso (4,214MB, MD5). Viacheslav Kaloshin has announced the release of Mandriva Linux 2011, code name "Hydrogen": "We are happy to announce that Mandriva 2011 is out." Some of the main new features in this release include hybrid live/installation DVD images, a revised system installer, new graphics theme, RPM 5, a series of new desktop utilities from Rosa Labs, and KDE as the only officially supported desktop environment: "GNOME, Xfce and other desktop environments and window managers are no longer included in the official Mandriva packages. However, contribution packages from the Mandriva community are available for these desktop environments. Starting from Mandriva 2011 only KDE 4 is officially supported." Here is the brief release announcement, but more details can be found in the release notes and on this 2011 tour page. Download: Mandriva.2011.i586.1.iso (1,647MB, MD5), Mandriva.2011.x86_64.1.iso (1,692MB, MD5). Eugeni Dodonov has announced the availability of the second (and last) release candidate for Mandriva Linux 2011: "Today Mandriva and ROSA teams proudly announce that Mandriva 2011 RC2 is available for download. In this release candidate we fixed more than 300 bugs and added or changed about 700 packages. Here are main changes since RC1: we added VirtualBox guest additions by default, now testing in VirtualBox gives more pleasure than ever; minor fixes in programs for configuring pptp/vpn/wi-fi; more network cards from Atheros and Intel are supported; restored some old and added some new Epson, HP and Lexmark printer drivers; now USB 3G is supported much better; we are working hard to improve KDM and Dolphin...." Check out the release announcement for a full changelog and a list of known bugs. Download: Mandriva.2011.RC2.i586.2.iso (1,643MB, MD5, torrent), Mandriva.2011.RC2.x86_64.2.iso (105MB, MD5, torrent). The first release candidate for Mandriva Linux 2011 is available for download. This pre-announcement, published some 24 hours before the release, lists the most important changes since beta 3: "Integration of (almost) final user interface, new login manager, desktop themes, plasma widgets, icons, backgrounds, splash screens, launcher, boot screens and desktop settings developed by ROSA Labs; initial version of Mandriva Sync and Sphere help-desk clients, developed by ROSA Labs; new version of Improver testing application, developed by ROSA Labs; Firefox 5.0, together with optionally installable beta and aurora versions; X.Org Server 1.10.2 with most up-to-date video and input drivers; Mesa 7.10.3 and libdrm 2.4.26 for most up-to-date 3D experience; Pidgin 2.9.0; OpenStack packages integrated into Cooker...." Download: Mandriva.2011-rc1.i586.iso (1,619MB, MD5), Mandriva.2011-rc1.x86_64.iso (1,680MB, MD5). Eugeni Dodonov has announced the availability of the third beta release of Mandriva Linux 2011. This is an unscheduled beta release on the pathway to the delayed 2011 version which is to be followed by a release candidate before the final release on an as-yet-unspecified date. From the release announcement: "As was previously announced on the Cooker mailing list, the Mandriva and Rosa teams have decided that additional time will be needed to finish the stabilization of Mandriva 2011 and Rosa 2011 desktop editions. Therefore I am gladly presenting Mandriva 2011 beta 3. Among the highlights of this release, the following items are present: from now on, the images contain non-free software for improved desktop experience; new UI theme for widgets, KDM and KDE environment, developed by ROSA Labs, is provided by default; new features in system panel, stack folders and system start menu.... Download: Mandriva.2011-beta3.i586.iso (1,557MB, MD5), Mandriva.2011-beta3.x86_64.iso (1,607MB, MD5). Eugeni Dodonov has announced the availability of the second beta release of Mandriva Linux 2011: "Despite the last-minute problems discovered last week which resulted in a 1-week delay, Mandriva 2011 beta 2 should finally be hitting the mirrors. As with previous beta release, the images are provided for i586 and x86_64 architectures, and are able to work in both live mode, and can be used for the installation. For this release, most of the UI and desktop-related features should be integrated, including a new login manager functionality, stack folder integration into the environment, new welcome and launcher application, new panel and overall desktop look-and-feel. It also features new default theme and artwork." Read the rest of the release announcement for more details. Download: Mandriva.2011-beta2.i586.iso (1,492MB, MD5), Mandriva.2011-beta2.x86_64.iso (1,520MB, MD5). 2011-03-18 Distribution Release: Mandriva Linux 5.2 "Enterprise Server"
Mandriva has announced the release of Mandriva Enterprise Server 5.2, an update to its server-oriented, commercial Linux distribution for enterprises: "Mandriva Enterprise Server (MES) 5.2 -- the simple, high-performance and accessible Linux server -- is now available. MES 5.2 features a broader set of drivers to support more devices during the installation process and an updated Linux kernel (version 2.6.33). It highlights advanced virtualization on top of KVM or Xen, a user-friendly software setup and configuration wizard, an easy-to-use LDAP directory management -- Mandriva Directory Server, powerful backup solutions and many other services in the fields of messaging, file and printer sharing, web hosting, network management and more." For more details please see release announcement and the release notes. Mandriva Enterprise Server 5.2 is available for purchase from the company's online store (starting at €299 inclusive of one year of maintenance support). A trial edition is available from here.